This year’s game, “Recycle Rush,” has opened the door to limitless innovation with one big stipulation…the team has only six weeks to strategize, prototype, design, build, and program a functional, 120-pound robot. This was the challenge presented to Mechanical Mayhem and hundreds of other high school teams across the globe at FRC’s 2015 Kickoff. week, students and mentors divided into sub-teams, determined by interest, to start the iteration process through prototyping. 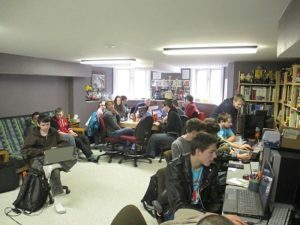 During the following weeks, the sub-teams worked together to refine the practice robot and CAD drawings incorporating the improvements in the competition robot, with which they practiced driving in the final week before Bag Day. The name of this year’s robot, “King Tote-n-Can-um,” was parodied from the renowned pharaoh, King Tutankhamun, and speaks of the robot’s ability to deftly handle both totes and cans. The team’s strategy was to build a robot capable of scoring high in autonomous, stacking four totes quickly and smoothly from the landfill, and regularly participating in Coopertition. Due to the absence of defense in Recycle Rush, the team decided on a mecanum drive base, where each of the four wheels is controlled and powered individually, allowing great maneuverability. Equipped with a dual belt elevator system, “King Tote” is capable of manipulating totes with four separate hands, and lifting both upright and tipped Recycling Containers (cans) with another hand. With each belt separately powered, the can and tote hands may move independently. The robot’s self-aligning software also allows the robot to automatically align to totes swiftly and efficiently. On Valentine’s Day morning, Mechanical Mayhem participated in the Week Zero scrimmage with only a few days left until Bag Day. 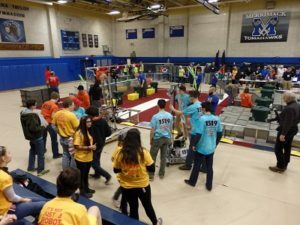 Mayhem competed with 18 other FRC teams at the informal tournament held at Merrimack High School and hosted by FRC Team 166 Chop Shop. They gained drive practice, data on the robot’s performance, and an understanding of this year’s gameplay. Although the tournament was cut short by a New England blizzard, Mechanical Mayhem benefited from this experience in the remaining hours before Bag Day.